I have my first finish of the year! It only took me six days. I finished the cow quilt I started in the Leni Wiener workshop back in October. 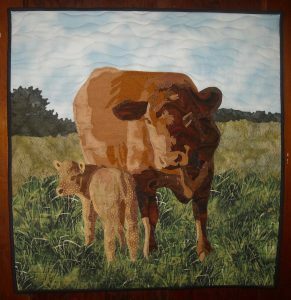 All I had left to do was put the cows on their background, then get it quilted and bound. It didn’t take near as long as I had envisioned it would in my head. Thanks to Shirley, I had a great grass background to put them on! She had this piece in her stash at the workshop, and kindly gave me a chunk of it to use. It was perfect! I’m making baseball/football quilts for our nephews. One of the tops is finished, and this is the second one. 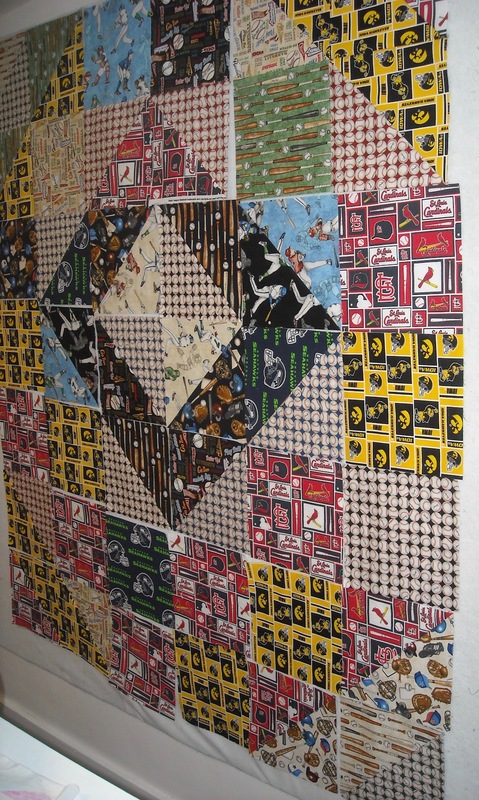 My Cowboy picked out all these fabrics with their favorite teams and some baseball motifs. I don’t think it all looks great together, but these quilts are for dragging around, so they’ll be fine. I’m planning to put Minky on the backs, so they’ll be good and snuggly. 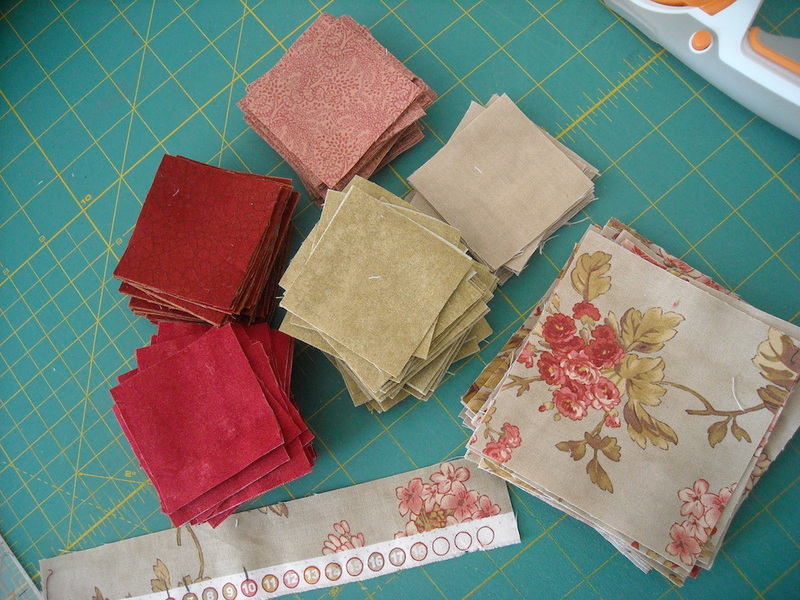 While I was cleaning off my cutting table the other day, and putting away still more fabric, I found a bunch of floral squares. I decided there were enough of them to make a small quilt if I added some coordinating scraps. So I did! Here’s how I chose the coordinating pieces to go with the squares . . .
See those colored dots on the selvage? Those color dots represent all the colors that are printed in that fabric. So I use those to choose fabrics to go with my focal fabric if I want everything to coordinate perfectly! Pretty handy, huh? 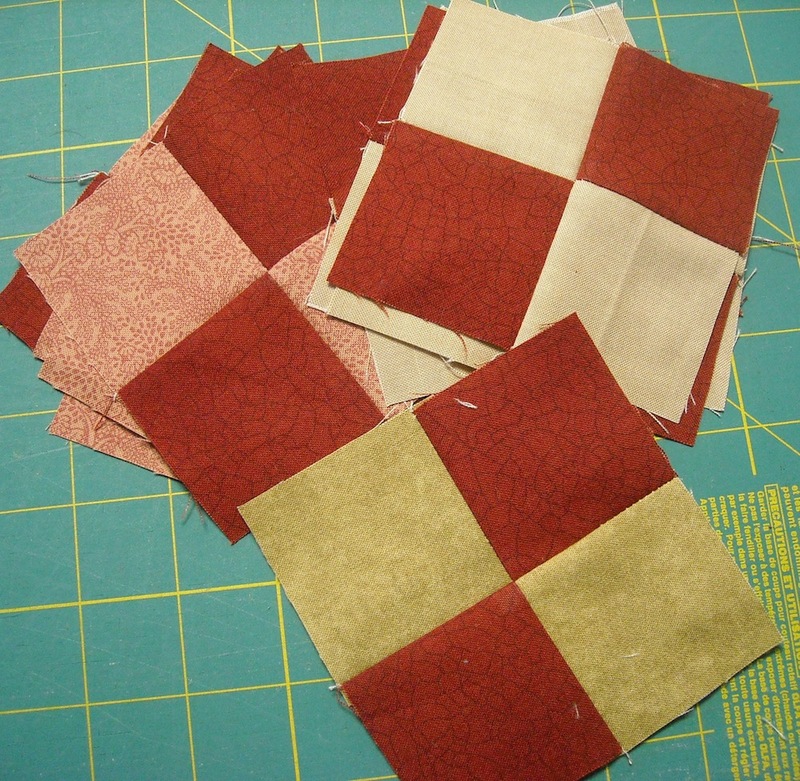 And now I’m making four-patches to go with the squares I had cut. This will end up as a donation quilt, I’m hoping to a lady at a nursing home. I know my grandmother would have loved a soft, pretty floral quilt like this, so I’m planning to find it a good owner. And now I’m back to my regular dilemma of “when am I going to get these quilted?” But the good news is: making backings for all of these will use up quite a bit more stash, so I’m really happy about that! I’m also gearing up to make some pillowcases to use up even more fabric. I’ll keep you posted on that project . . .
Shelly, the cow/calf quilt is great!! I love it. And whipping out two more tops at retreat is fantastic! You are on FIRE!! As for me, you asked what have I been working on? Absolutely NOTHING. Too much company and football playoff games for me lately. I finally got all my Christmas cards mailed, so I’m about ready to get rolling on something. Maybe tonight! for the week. Very Blessed . 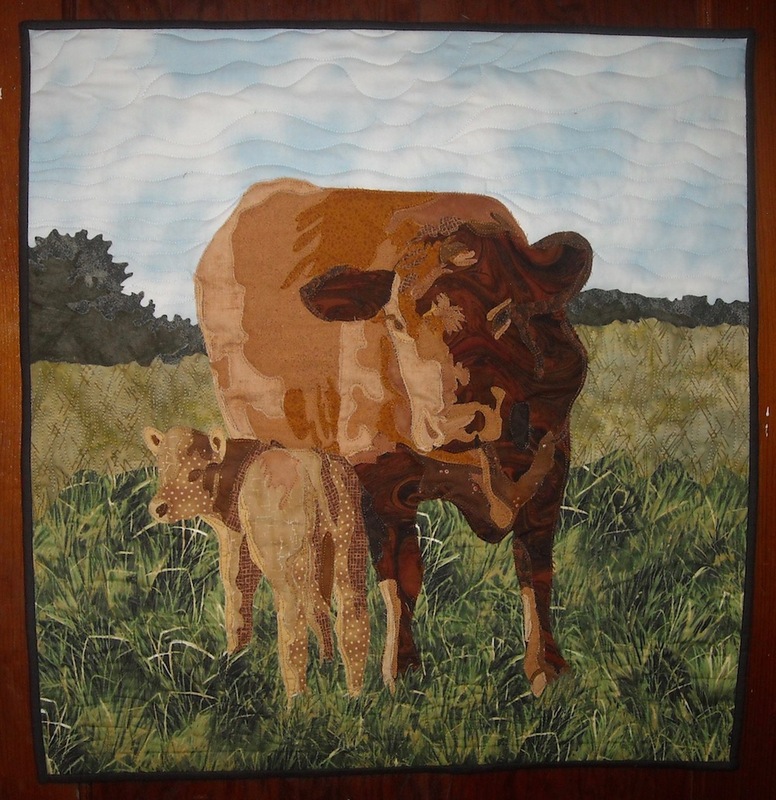 I love the cow/calf quilt, it’s amazing. I can’t imagine doing that. I have major quilting ADD once again, bopping from one thing to the next. I’m going to finish a quilt top I started on the other day; it’s going together really quick, I just keep getting interrupted. Then I’m going to pull together some stitch work to do tonight while watching a show. I am continuing to work on organizing my fabrics by color and UFOs. I upped my time from one hour to two. Its coming along with organizing. As far as my UFO, I am working on my Dear Jane, Farmer’s Wife Sampler and a “stupid” quilt kit. I did manage to finish two wall hanging from 2009 & 2010. To explain about the “stupid” quilt. First off I was missing a fabric from the kit. Not a problem there because I was able to find a fabric that works. The problem is the instructions! All do respect to the designer, but the instructions “stinks”! It was not well written. Half the time you have to figure out what to do next. I don’t remember when I bought this kit. But I am half way there. LOL…sorry didn’t mean to write a book here. 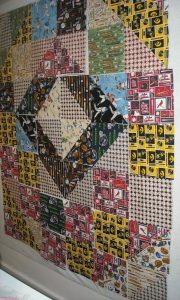 I am quilting a scrap quilt from the last time Aunt Janet and I were together. I do finish putting together the top from the Beeutiful quit along. 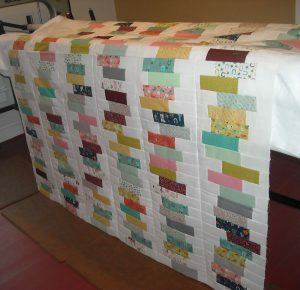 Guess were I will be going on Saturday – exactly the quilt shop need a back so it can go on the longarm next. I am on an organizing bender, going through container after container and dealing with the contents (discarding, donating, tidying, and putting things where they actually belong(!) Also sewing up some of the forgotten things I am finding. Really enjoying myself with it. Also participating in the RSC challenge and working on blocks from my purple stash. 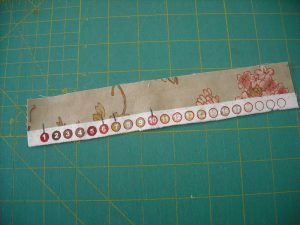 Clever idea – I’ll be using that next time I want to add scraps to a quilt plan. Thank you, Shelly. Love your cow and calf.. I have heard of the selvege tip before, but have never actually used it. Must remember to do that. Our guild is retreating this weekend and I’m prepping for that. 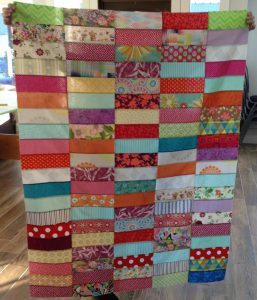 The cow quilt is amazing, great job on your scrap quilts! I haven’t done any sewing still working on organizing. I have made up list of UFO’s sadly only able to cross off 2 projects from previous year. Hoping for more organizing time over the weekend. 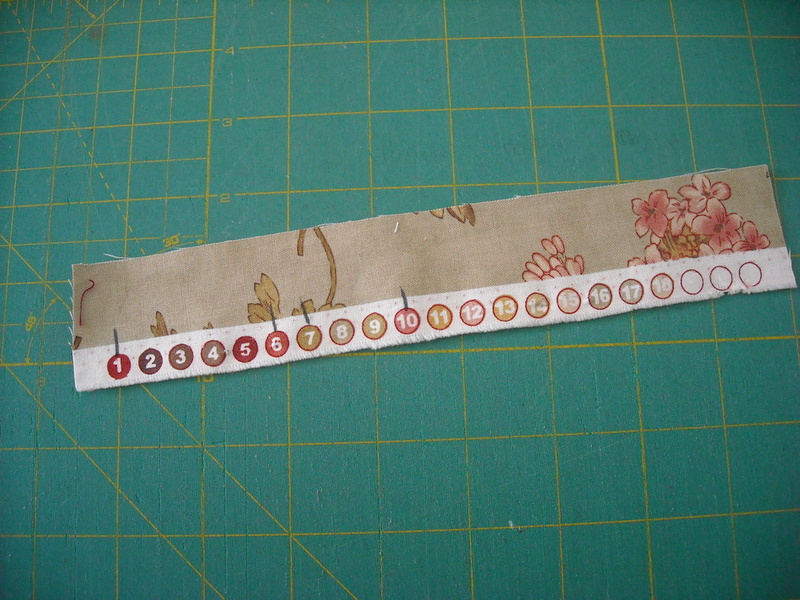 Lots of lovely scrappiness! Maybe block count, too?